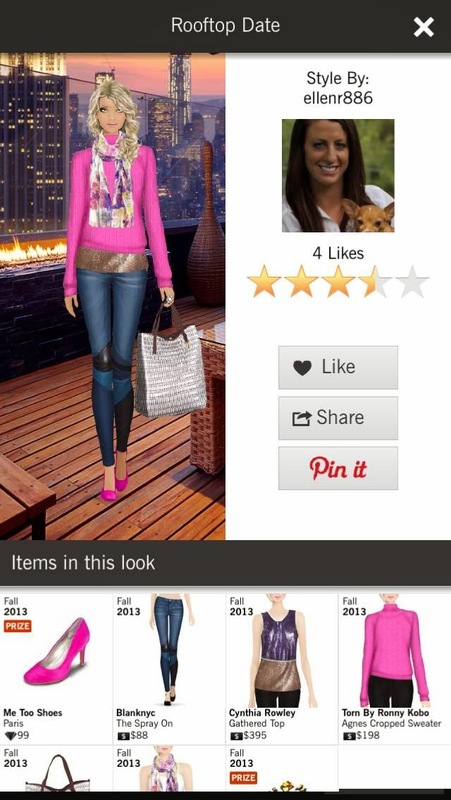 So when I was at LuckyFABB last month I discovered the most amazing fashion app ever for my iPhone. It's called Covet and it's basically an opportunity for you to build a wardrobe, style different looks, enter into contests to get cash (for more clothing) and tickets (to enter into events), and vote on other's looks!! The best part about it is that it's actual items that are currently sold by actual brands and designers such as Kill City, Hudson, and more!!! So here are 5 reasons why I love it and why you will too. 1. It gives me my shopping fix. Whether it's an item I can't afford in real life or just something I want to buy because it's cute, I can save my cash and purchase it in the app, all while saving money in real life! 2. It gives me outfit inspiration for my own closet. I screen shot outfits I like even by other players and I seriously have seen a major improvement in the outfits I've been wearing in real life lately, mostly because I got inspiration from the app! 3. I discovered some new brands. And I even discovered that some brands are more affordable than I once thought! I am now keeping my eye on some Kill City pieces that I saw on their real life website! 4. You get virtual cash for shopping when you refer friends! Speaking of... if you use my link, you will get me cash and then I will be able to go to your closet, check out your looks and even hit the LIKE button on them! 5. You can win REAL LIFE PRIZES! They hold little style challenges on the Covet Instagram page and they even have real life prizes offered in weekly challenges!! !